Thinking about putting together a team to compete at the inaugural Tribal Clash USA on Huntington State Beach, California but not sure what to expect? 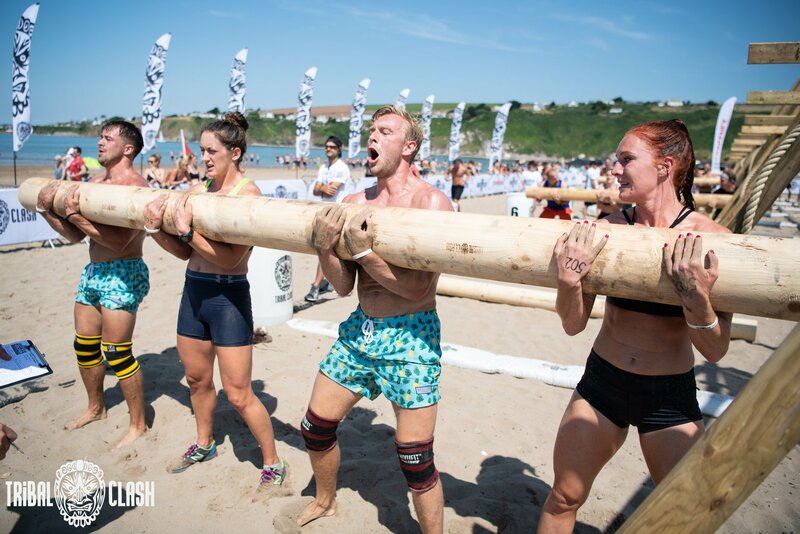 Tribal Clash is already one of the most hyped fitness events in Europe, holding annual sell-out throwdowns in the UK and Portugal which teams travel to from far and wide. The first stateside version will be held on 15th & 16th June with teams flying from the UK just to compete – there really is nothing else quite like it in the USA so put together your team and see what all the fuss is about! Tribal Clash is all about performing well as a team. Personal strengths will not necessarily bring a team up but personal weaknesses will certainly bring a team down. A collection of six strong individuals does not necessarily make for a successful team. If communication, camaraderie or leadership are lacking then the team will not do well, regardless of individual capabilities. The best teams are the ones who work together as one well-oiled machine and remember to have a good time while they do it. Southern California, “the cradle of fitness” is home to some of the world’s best CrossFit boxes and functional fitness gyms. As well as being the ultimate test of team fitness where athletes compete to make their fitness family proud, Tribal Clash is also a sociable event where competitors can meet like-minded individuals from their community- come along and cheer on other teams and make new friends! There’s no better feeling than mastering something you thought was impossible, whether it’s lifting a heavy atlas stone, getting up and over a bar unassisted or completing a 6 man paddleboard race without falling in. Come along and see what you could achieve, and don’t forget the celebrations are always better when you’re part of a team! Tribal Clash will push all athletes to their limits. Workouts are varied, innovative and test all aspects of fitness and teamwork, so we welcome anyone who is willing to get outside their comfort zone and work hard for their team. Tribal Clash isn’t a beginners’ competition but it is great for beginners, while elite athletes will enjoy the thrill of testing themselves in a completely unique environment. Previous competitors have included everyone from newbies to CrossFit Games athletes, so come along and show us what you’ve got regardless of your age, ability and experience,! Our professional event photographer captures all the action, so you can spend the weeks after the competition combing through all the photos on social media and tagging your teammates. What better way is there to tell the world about your amazing weekend on the beach than with a photo of you looking badass with a massive atlas stone on your shoulder! Whether you’re travelling just a few miles to Huntington State Beach or flying across the country, this is a fantastic opportunity to spend some quality time with your teammates. You’ll be on the beach for the entire weekend with plenty of time between workouts to chill out, watch other heats and plan your strategies…and why not bring along other members of your tribe to be your cheerleaders! Tribal Clash is more than just a competition, it’s a party on the beach with an electric atmosphere thanks to the DJ who plays in the heart of the arena. End the weekend with a few drinks at the closing party, where you can celebrate your success and reminisce with your teammates!